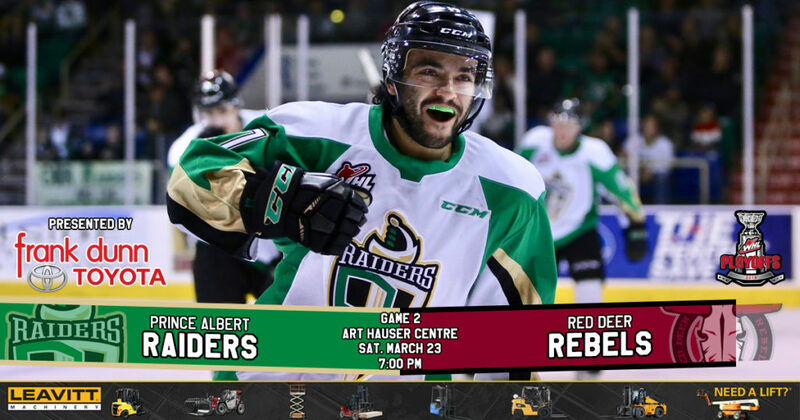 RAIDER REVIEW: The Raiders and the Red Deer Rebels continue their Round 1 series of the 2019 WHL Playoffs tonight in Game 2 at the Art Hauser Centre. Last night, the Raiders took the opening game of the series with a 3-0 victory over the Rebels. Ian Scott earned his first career WHL Playoffs shutout with 21 saves. Dante Hannoun, Sean Montgomery, and Ozzy Wiesblatt all scored for the Raiders. VS. RED DEER: The Raiders lead the best-of-seven series 1-0. The Raiders won the regular season series 3-1-0-0. SHUTTING THE DOOR: Ian Scott carried over his strong play from the regular season to the 2019 WHL Playoffs. The Toronto Maple Leafs prospect picked up his fourth shutout in six starts on Friday night. He is the first Raiders goaltender to earn a shutout in the post-season since Jesse Deckert on March 28, 2007 against the Brandon Wheat Kings. GETTING THEIR FEET WET: Ozzy Wiesblatt and Aliaksei Protas had a successful adjustment to the WHL Playoffs on Friday night in their post-season debuts. Protas set up Dante Hannoun’s first-period goal that held up as the game winner, while Wiesblatt scored his first WHL Playoffs goal midway through the second period. Protas and Wiesblatt finished first and second in Raiders rookie scoring, respectively. SNIPING: Sean Montgomery extended his WHL Playoffs point streak to four games with his second-period goal on Friday night. Over those games, the overager from Calgary has four goals and an assist. In 13 career playoff games, Montgomery has five goals and three assists. WINNER WINNER: Dante Hannoun recorded the fifth WHL Playoffs game-winning goal of his career on Friday night. The Delta, BC product has the most playoff experience among the Raiders with 33 games. In those contests, Hannoun has nine goals and 15 assists. NEXT UP: The opening round series shifts to Red Deer as the Raiders and Rebels square off on Tuesday night at the ENMAX Centrium. Puck drop is 7 p.m.